Around the time of the publication of Career of Evil (October 2015), J.K. Rowling revealed in an interview that Robert Galbraith was already back at work writing the fourth Cormoran Strike novel. Later, she also revealed that she was working on another novel under her own name alongside the fourth Strike book, not to mention the Fantastic Beasts sequels she is writing the screenplays for. She’s a very busy woman! In March 2017, a fan (@luminousmax405) asked J.K. Rowling on Twitter for any hints about the title of the fourth book. She responded with a hangman-like game so fans could guess the title themselves. Here are some of the titles people guessed. 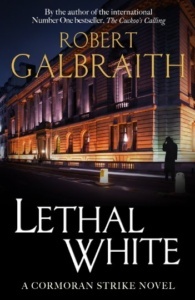 It took around 52 minutes for someone to guess the title correctly: Lethal White. At the end of January (2018), she announced on Twitter that Lethal White would be the longest Cormoran Strike novel so far. She also gave us some insight on how she has planned the novel’s complex plot. According to Rowling, she had the idea for the plot back in 2013 and has gone through some huge revisions since. 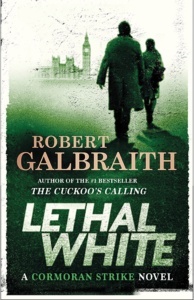 On 23rd March 2018, J.K. Rowling announced that Lethal White was finally finished! There has been much speculation about the meaning of the title. Many fans believe it could refer to a lethal white drug that has caused a death Strike and Robin will be investigating. It is definitely going to be related to the lethal white syndrome in horses, however, as she has used multiple photos of white horses for her header photos on Twitter. 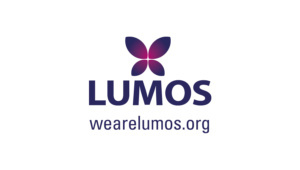 J.K. Rowling revealed in an interview that the fourth book will begin immediately after the events in Career of Evil, as opposed to having a flashback later in the book. After leaving us on that cliffhanger, fans will be very grateful for this! Two fan-made covers of the book were designed by PottersCave and Kernel’s Corner. Rowling mentioned on Twitter that one of these covers would be particularly appropriate for the book. If you follow the author closely on Twitter, you might remember some of her header photos, which are always related to the thing she’s writing about. 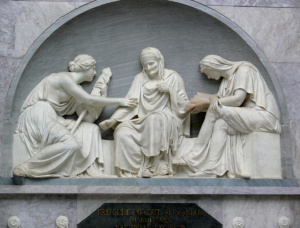 One of these headers was a photo of a statue of The Fates. This isn’t the only time that Greek mythology is mentioned in the series. Whether Cormoran Strike did Classics or something similar at Oxford University, he is obviously very knowledgable on the subject. So we are probably right in thinking that the Fates and Greek mythology are going to feature more prominently in Lethal White. 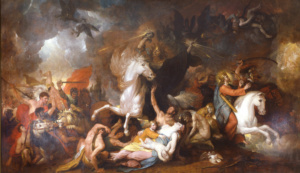 Another of J.K. Rowling’s header photos is a painting: Death on the Pale Horse. With the link to the lethal white syndrome in horses and the theme of death and the Fates, it is easy to assume that this also has something to do with the fourth Strike book. It would make sense if the term Lethal White referred to a drug overdose. Perhaps we will learn more about Leda Strike, as she died from a heroin overdose. In the meantime, while we’re all waiting for Lethal White, Strike – Career of Evil is available to own on DVD from 16th April. American fans will get the show in June this year on Cinemax under the title CB Strike. Some great detective work there, guys!! 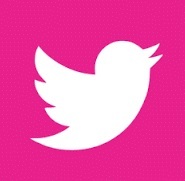 Curious about the Henry Gibson quotes at chapter beginnings? Anyone with details? I heard the same name as you in the audiobook, but the author is Norwegian playwright Henrik Ibsen, and the play is called Rosmersholm. I heard the same name as you in the audiobook, but the author is actually Nowegian playwright Henrik Ibsen and the play in question: Rosmersholm. A mystery. All my internet queries only mentioned two books and no author info about author Henry Gibson. The author’s name is Henrik Ibsen. and learns that it may be a lost George Stubbs artwork depicting a mare mourning a foal that died of lethal white syndrome. If its provenance were to be established, it would be worth over twenty million pounds. I thoroughly enjoyed this series. Looking forward to watching Lethal White.